A group of law enforcement officials blasted a measure on the November ballot billed as an effort to keep “non-violent” convicts out of prison, saying the proposition will put dangerous people back on the streets. “Do we really need more parolees and hard-core criminals on the streets? That’s what Proposition 57 does,” said Brian Moriguchi, president of the Professional Peace Officers Association of Los Angeles at a press conference in Downtown Los Angeles last Friday. The proposition, backed heavily by Gov. Jerry Brown, would allow parole consideration for people convicted of “non-violent” felonies after serving the minimum amount of time required as part of their sentence and authorize the awarding of sentence credits for rehabilitation, good behavior and education. It would also give judges the final say over whether juvenile offenders at least 14 years old should be prosecuted as adults. rehabilitated and do not present a danger to the public before they are released. But Moriguchi and other officials — including Sheriff Jim McDonnell, District Attorney Jackie Lacey and county Supervisor Mike Antonovich — said the measure is essentially an effort by the state to relieve its prison-overcrowding problem at the expense of community safety. Moriguchi said the recent killings of Los Angeles County sheriff’s Sgt. Steve Owen and Palm Springs police Officers Lesley Zerebny and Jose Gilbert Vega were carried out by parolees. Antonovich said Proposition 57 will follow the path of legislation known as AB 109, which redirected some low-level offenders to county jails instead of state prisons, often leading to them serving less time than they otherwise would. He said that legislation was also expected to apply to only “non-violent” offenders. “What happened? Seventy percent are either high-risk or very high-risk,” Antonovich said. Supporters of the measure deny allegations that the measure would result in felons being automatically released from prison or authorize parole for violent offenders. With over 69 million millennials eligible to vote in November, candidates for political office across the country are spending a lot of time and money courting people between the ages of 18 and 37, hoping to get their votes. But while their numbers are large, as a group millennials tend to be less civically engaged and historically vote in lower numbers than older voters. On Monday, three of California’s members of Congress met with students at Rio Hondo College for an open discussion on the issues that matter most to young Americans, and to remind them voting is the best way to be heard. “You have a voice,” Rep. Grace Napolitano (CA-32) told the crowd. “We are supposed to represent you,” she said, encouraging them to get involved. The meeting was one of over 20 #FutureForum town hall-style meetings being held across the country to get a pulse on the challenges millennials face. On Monday, students said they are concerned about climate change, mental health, police brutality, campaign contribution limits and student debt. According to #FutureForum Chair, Rep. Eric Swalwell (CA-15) – student debt is the biggest issue millennials say they are facing. U.S. Reps. Eric Swalwell, Grace Napolitano and Norma Torres discuss ‘millennial issues’ with students at Rio Hondo College Monday. At 35, Swalwell is the youngest member of California’s congressional delegation and a millennial himself. With $100,000 in student debt, he says he knows first hand how the financial burden is causing millennials like him to delay three major life decisions and rights of passage: starting a family, buying a home and starting a business. Student debt has led millennials to “put their lives on hold to pay their loans,” echoes Rep. Norma Torres (CA-35). While she was able to buy her first house at the age of 22, she confided that her 30-year-old son is struggling to pay his student loans and not likely to buy a home for some years to come. When asked who can imagine owning a home in the next 10 years, only a handful of the Rio Hondo students raised their hands. On average, college graduates across the county have about $30,000 in student debt. According to The Institute for College Access and Success, the total amount of student debt nationally is $1.2 trillion. Write to your representatives in Washington, D.C. and tell them to pass legislation to bring relief to the student debt crisis, Torres encouraged students. The state of the economy is one of the prime reasons so many students are struggling to pay back their loans, Torres told EGP. Many students are getting degrees that are not competitive in today’s economy, she said. Students “are graduating from wonderful colleges with really high tuition, but it doesn’t translate to great jobs so young people are feeling like it’s money wasted,” she explained. But the student debt crisis is not just a problem for millennials, says Swalwell. Whether it’s because their children are moving back home or because they have personally taken out or co-signed for college loans, “parents are carrying the burden too,” he pointed out. Jesse Carmon, 57, of Hacienda Heights, wanted to know what type of relief young adults like his son could expect in the future. The hope is that in the near future students will have access to free in-state tuition and the option to refinance their loans, responded the speakers. Hearing complaints from students about the outsized influence of lobbyists and large donors to political campaigns, the representatives encouraged students to turn their concerns into votes. “Money talks, but there’s nothing like a vote,” emphasized Napolitano. 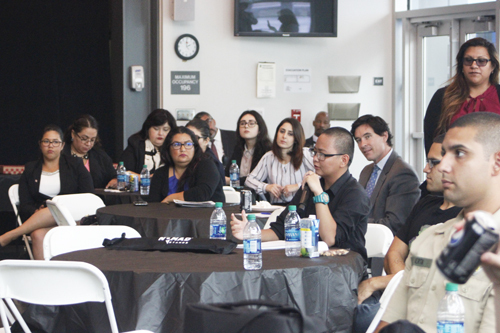 Millennials need to be informed, educated and get involved, added the forum’s moderator, Rio Hondo College Student Trustee Brandon Pablo Leon. A show of hands revealed that only one woman in the room had ever written to a member of Congress. “It’s not just voting, it’s about being politically active,” Leon said. Millennials are key to the success of not only the state but also the entire country, Torres reminded the students.